× 4 = 4 Required Please enter the correct value. 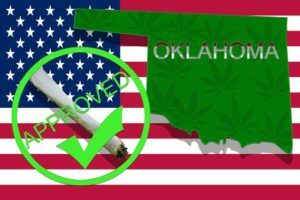 Oklahoma joined the $10 billion cannabis revolution on June 26, becoming the 30th state to legalize medical marijuana. In fact, doctors can recommend marijuana for any medical condition they see fit, which is considered very progressive for a "red state." And it's just one more sign marijuana legalization is sweeping the nation, creating one of the greatest organic profit opportunities in generations. The pro-marijuana group, Vote Yes on 788, estimated medical marijuana sales in the Sooner State would generate between $10 million and $30 million in revenue by the second year the program is up and running. Under the new Oklahoma marijuana law, patients who receive state ID cards can legally possess three ounces of cannabis in public, according to Forbes. Patients can also store up to eight ounces of cannabis at their homes, and they can designate a caregiver to purchase or grow medical marijuana for them. Oklahoma legalizing medical cannabis now means 66% of the country has legalized medical marijuana in some form. And Oklahoma joining the cannabis revolution opens the door for cannabis farmers, marijuana real estate firms, and dispensaries to make even more money. What are the companies that are just starting up in this field, so I can make some investments in this state.